“This was a great opportunity to purchase strategically located, shallow-bay industrial buildings in Atlanta's premier industrial submarket at below replacement cost.” Kris Miller, Ackerman & Co.
ATLANTA, GA, August 31, 2018 — Ackerman & Co. announced today it has purchased a 4-building, 166,481-square-foot industrial portfolio on Warren Drive in Norcross, Ga., in Atlanta's core Northeast industrial submarket. The firm acquired the distribution buildings from an undisclosed seller for $9.75 million. Frank Farrell, a senior vice president at Ackerman & Co., will lead leasing efforts at the properties. 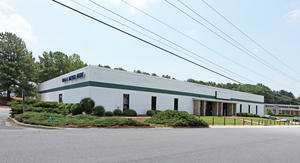 Matt Wirth, Dennis Mitchell and Lee Cardwell of Colliers International represented the seller in the transaction. The nearly 200-million-square-foot Northeast industrial submarket has been averaging more than 5 million square feet of positive net absorption annually in the past six years, and vacancy levels are currently under 6 percent. The Warren Drive micro market is experiencing historically low vacancy rates of approximately 3 percent. The acquired Warren Drive facilities are 92 percent leased to a diverse mix of 12 tenants, which include CompuPoint USA (56,690 square feet), Transit U.S.A. (19,275 square feet), South Pak (7,328 square feet) and Clopay Building Products Co. (6,464 square feet). Recent capital improvements at the properties include new roofing and canopies, T-5 lighting, repaved parking lots and landscaping upgrades. The facilities in the newly purchased Warren Drive portfolio are: 6332 Warren Drive (25,000 square feet), 6424 Warren Drive (56,690 square feet), 6452 Warren Drive (30,762 square feet) and 6454 Warren Drive (54,029 square feet). The Warren Drive acquisition is part Ackerman & Co.'s ongoing strategy of acquiring well-located industrial space in Atlanta's major industrial submarkets. The firm's recent purchases include 801 Blacklawn Road, a 111,540-square-foot warehouse/distribution facility in Conyers, Ga., located in the Snapfinger/I-20 East industrial market; and a four-building, 217,089-square-foot industrial portfolio in Lavista Business Park in the Tucker/Stone Mountain submarket. Headquartered in Atlanta, Ackerman & Co. is a privately held, full-service commercial real estate firm focused on providing quality investment, brokerage, management and development services in the Southeast. The company, founded in 1967, retains an expert team of more than 100 real estate professionals. To date, Ackerman & Co. has developed and acquired 36 million square feet of office, medical, industrial, retail and mixed-use space, has more than 8 million square feet under management, and maintains an investment portfolio valued at $1 billion.